N. Ho, T. Nguyen, A. Patel, A. Anandkumar, M. E. Jordan, R. G. Baraniuk, “Latent-Dependent Deep Rendering Model,” ICML Workshop on Theoretical Foundations and Applications of Deep Generative Models (TADGM), 2018. Posted in Uncategorized on July 12, 2018 by jkh6. Rice DSP alum Rebecca Willett (PhD 2005) is joining the University of Chicago as a Professor of Computer Science and Statistics, where she will be developing a new machine learning initiative. 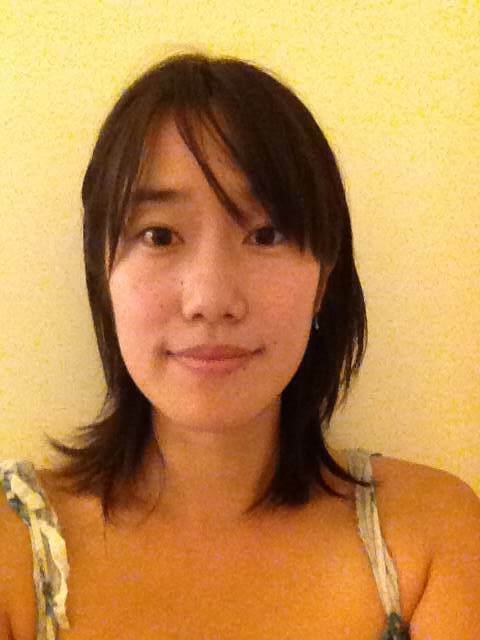 Her research interests include machine learning, network science, medical imaging, wireless sensor networks, astronomy, and social networks. 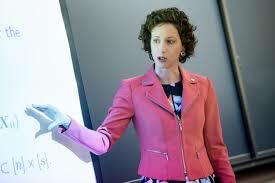 She has also held positions at the University of Wisconsin-Madison and Duke University. Rebecca has received the NSF CAREER Award and AFOSR YIP, and has served as a member of the DARPA Computer Science Study Group. Posted in Uncategorized on June 25, 2018 by jkh6. C. A. Metzler, A. Mousavi, R. Heckel, and R. G. Baraniuk, “Unsupervised Learning with Stein’s Unbiased Risk Estimator,” https://arxiv.org/abs/1805.10531, June 2018. Learning from unlabeled and noisy data is one of the grand challenges of machine learning. As such, it has seen a flurry of research with new ideas proposed continuously. In this work, we revisit a classical idea: Stein's Unbiased Risk Estimator (SURE). We show that, in the context of image recovery, SURE and its generalizations can be used to train convolutional neural networks (CNNs) for a range of image denoising and recovery problems without any ground truth data. Specifically, our goal is to reconstruct an image x from a noisy linear transformation (measurement) of the image. We consider two scenarios: one where no additional data is available and one where we have measurements of other images that are drawn from the same noisy distribution as x, but have no access to the clean images. Such is the case, for instance, in the context of medical imaging, microscopy, and astronomy, where noise-less ground truth data is rarely available. We show that in this situation, SURE can be used to estimate the mean-squared-error loss associated with an estimate of x. 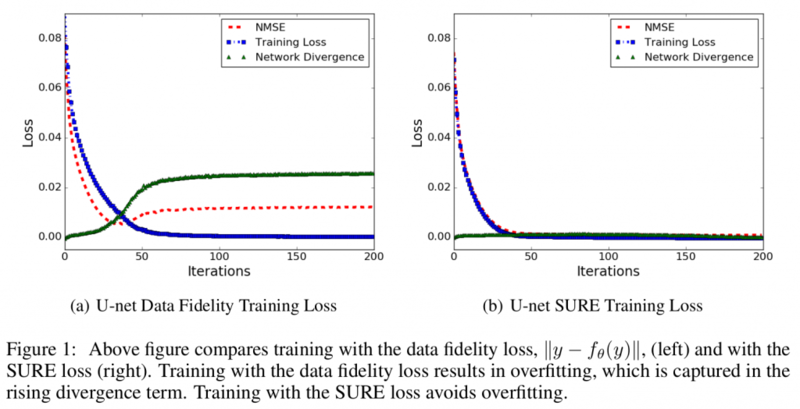 Using this estimate of the loss, we train networks to perform denoising and compressed sensing recovery. In addition, we also use the SURE framework to partially explain and improve upon an intriguing results presented by Ulyanov et al. in "Deep Image Prior": that a network initialized with random weights and fit to a single noisy image can effectively denoise that image. Posted in Uncategorized on June 13, 2018 by jkh6. J. K. Adams, V. Boominathan, B. W. Avants, D. G. Vercosa, F. Ye, R. G. Baraniuk, J. T. Robinson, A. Veeraraghavan, “Single-Frame 3D Fluorescence Microscopy with Ultraminiature Lensless FlatScope,” Science Advances, Vol. 3, No. 12, 8 December 2017. 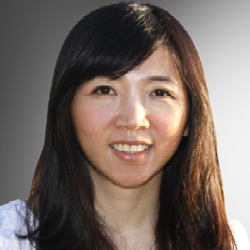 Abstract: Modern biology increasingly relies on fluorescence microscopy, which is driving demand for smaller, lighter, and cheaper microscopes. However, traditional microscope architectures suffer from a fundamental trade-off: As lenses become smaller, they must either collect less light or image a smaller field of view. To break this fundamental trade-off between device size and performance, we present a new concept for three-dimensional (3D) fluorescence imaging that replaces lenses with an optimized amplitude mask placed a few hundred micrometers above the sensor and an efficient algorithm that can convert a single frame of captured sensor data into high-resolution 3D images. The result is FlatScope: perhaps the world’s tiniest and lightest microscope. FlatScope is a lensless microscope that is scarcely larger than an image sensor (roughly 0.2 g in weight and less than 1 mm thick) and yet able to produce micrometer-resolution, high–frame rate, 3D fluorescence movies covering a total volume of several cubic millimeters. The ability of FlatScope to reconstruct full 3D images from a single frame of captured sensor data allows us to image 3D volumes roughly 40,000 times faster than a laser scanning confocal microscope while providing comparable resolution. We envision that this new flat fluorescence microscopy paradigm will lead to implantable endoscopes that minimize tissue damage, arrays of imagers that cover large areas, and bendable, flexible microscopes that conform to complex topographies. Fig. 1. Traditional microscope versus FlatScope. (A) Traditional microscopes capture the scene through an objective and tube lens (~20 to 460 mm), resulting in a quality image directly on the imaging sensor. (B) FlatScope captures the scene through an amplitude mask and spacer (~0.2 mm) and computationally reconstructs the image. Scale bars, 100 μm (inset, 50 μm). (C) Comparison of form factor and resolution for traditional lensed research microscopes, GRIN lens microscope, and FlatScope. 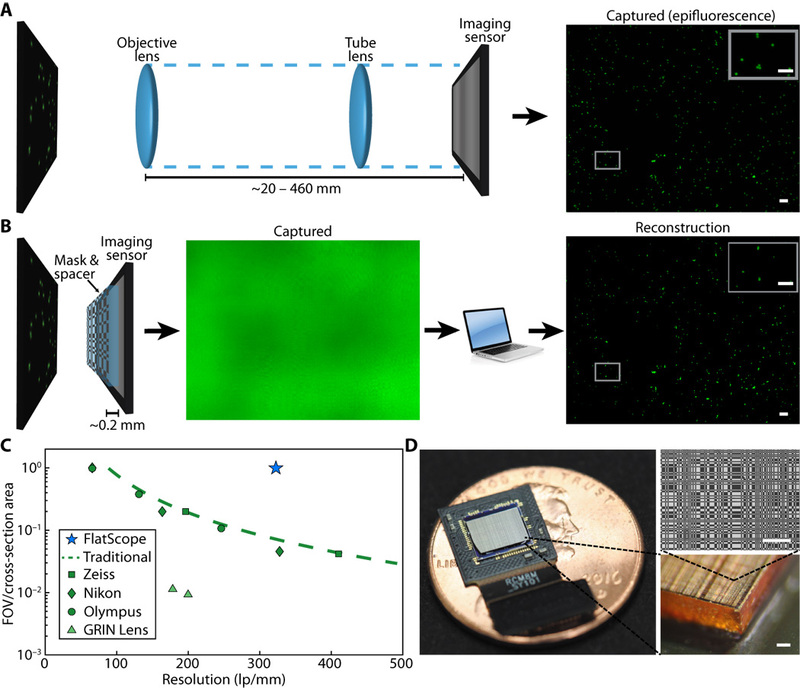 FlatScope achieves high-resolution imaging while maintaining a large ratio of FOV relative to the cross-sectional area of the device (see Materials and Methods for elaboration). Microscope objectives are Olympus MPlanFL N (1.25×/2.5×/5×, NA = 0.04/0.08/0.15), Nikon Apochromat (1×/2×/4×, NA = 0.04/0.1/0.2), and Zeiss Fluar (2.5×/5×, NA = 0.12/0.25). (D) FlatScope prototype (shown without absorptive filter). Scale bars, 100 μm. Posted in Uncategorized on June 12, 2018 by jkh6. Congratulations to Jesse Adams, who won the 2018 Entrepreneurial Computer Vision Challenge at the LDV Vision Summit in New York City. 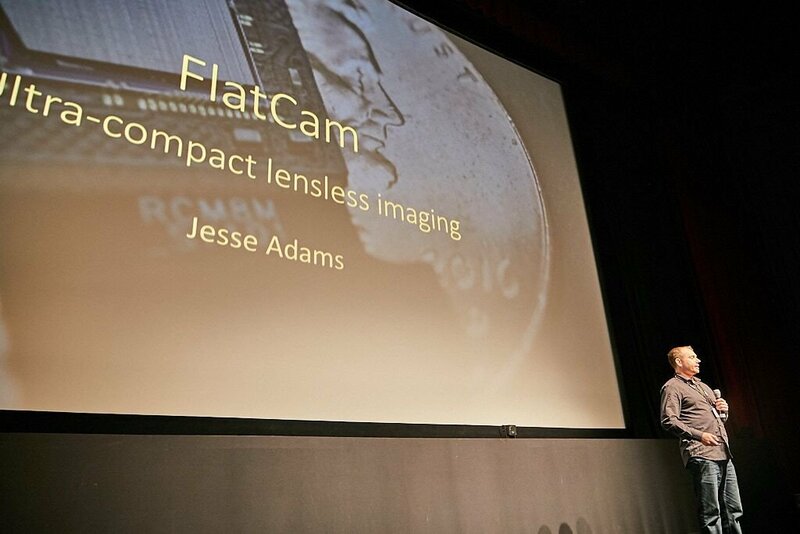 Jesse presented FlatCam and FlatScope to 600 top industry VCs, media executives, and vision companies and out-visioned them all (pun intended). Posted in Uncategorized on May 30, 2018 by jkh6. 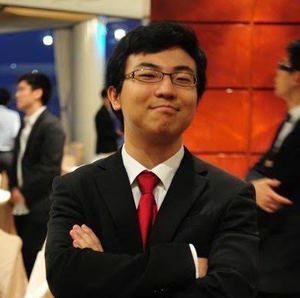 Rice DSP PhD Andrew Lan (PhD, 2016) has accepted an Assistant Professor position at UMass Amherst in the Department of Computer Science. 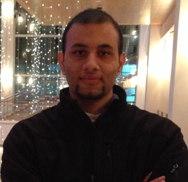 He has spent the past two years as a postdoc at Princeton University and OpenStax. His research interests revolve around the development of human-in-the-loop machine learning methods that enable scalable, effective, and fail-safe personalized learning in education. Andrew joins DSP PhD alum Marco Duarte at UMass. Rice DSP postdoc Gautam Dasarathy has accepted an Assistant Professor position at Arizona State University in the Department of Electrical and Computer Engineering. 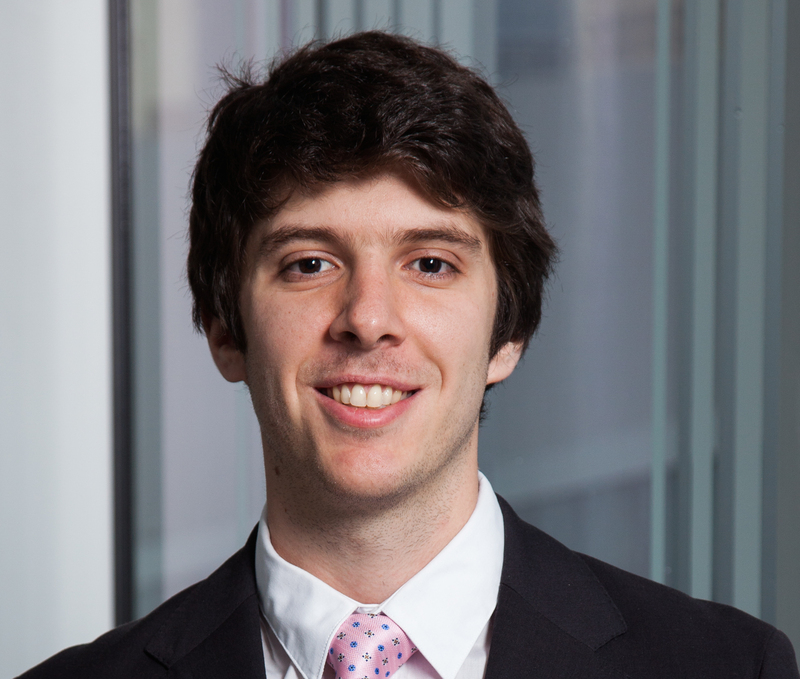 His research interests lie at the intersection of machine learning, signal processing, statistics, and information theory. He is particularly interested in the integrated design of learning algorithms and data acquisition systems (e.g., active learning) that involve both machine and human components.